Camp Bestival is completely family friendly, so why not take the kids for a weekend of music plus loads of fun activities like medieval jousting? Fancy dress is the theme, so the brighter and funkier your outfit the better. Moschino is one of the most fun, funkiest labels going and its little sister label Love Moschino is ultra affordable. Green Man is a folk-themed festival which has to mean long boho style maxi dresses and gypsy style tops. 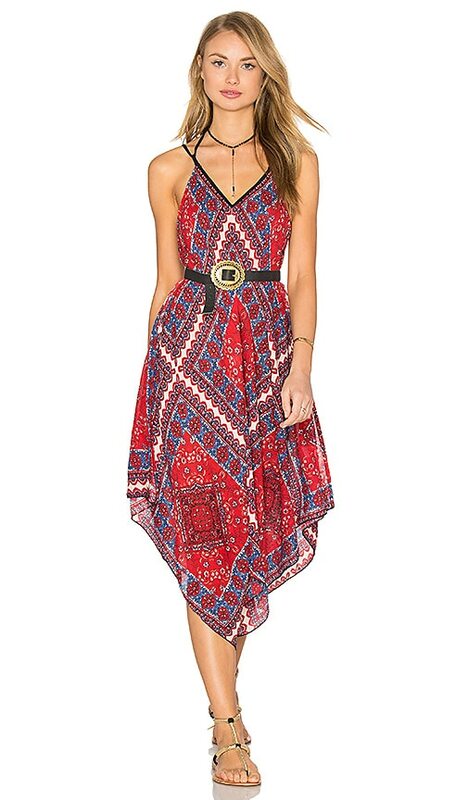 Band of Gypsies is a fab folky label and this red sleeveless handkerchief hem dress is perfect for floating around a field in. Reading and Leeds festivals’ are where “the cool kids go”, so expect lots of denim cut-offs and band tees. Add a choker to bring your festival look bang up to date for 2016. River Island has a nice selection to choose from, including the BlackBow Choker. If clubbing is more your thing, get the festival feel with this open-air clubbing event featuring the Chemical Brothers, Rudimental and Dizzee Rascal. Stand out on the makeshift dancefloor in pieces like these shorts by Milly. A bandeau top and flatforms make a comfy and cool clubbing outfit. This perfectly posh festival in Cambridgeshire has plenty of colourful fun on offer, from paint fights to dance offs. This arts and music festival is all about being at one with nature, so you won’t go far wrong with florals. A floral playsuit is super practical for dancing and sitting on the grass in. Just add leather sandals and you’re ready to party!